This brand new series for the Smile Town Dentistry Blog, the SmileTown Book Club regularly features comforting, informative and engaging books for children about visiting the dentist. Sugarbug Doug was written and illustrated by dentist Ben Magleby, in order to teach kids about how to avoid dental disease. Sugarbug Doug is all about sugarbugs, who are on a mission to destroy your teeth, and make your breath awful, too! Sugarbugs are bacteria that live in your mouth and live off the sugars you consume that linger on your teeth, causing tooth decay and bad breath. Ben Magleby has written this book to help teach children about the causes of dental disease, and what they can do to avoid it. It teaches them the simple steps, dietary choices, oral hygiene habits, and regular dental appointments, that can all help keep the sugarbugs at bay, and teeth clean and healthy. 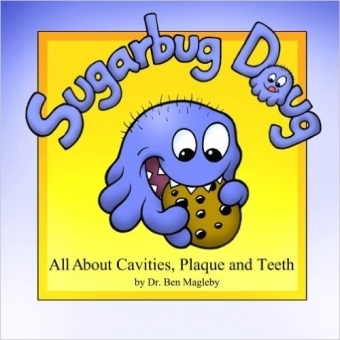 Sugarbug Doug appeals to children because it teaches them about oral health in an engaging way. It shows them that they have agency in their oral health, and gives them the tools and information they need to keep their smiles healthy. This information is presented in an easy-to-understand manner, and the expressive, bright, funny illustrations especially draw kids and adults alike to this informative and clever book.